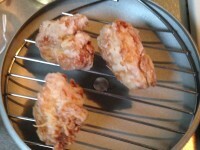 I have posted “Kara-age” before. 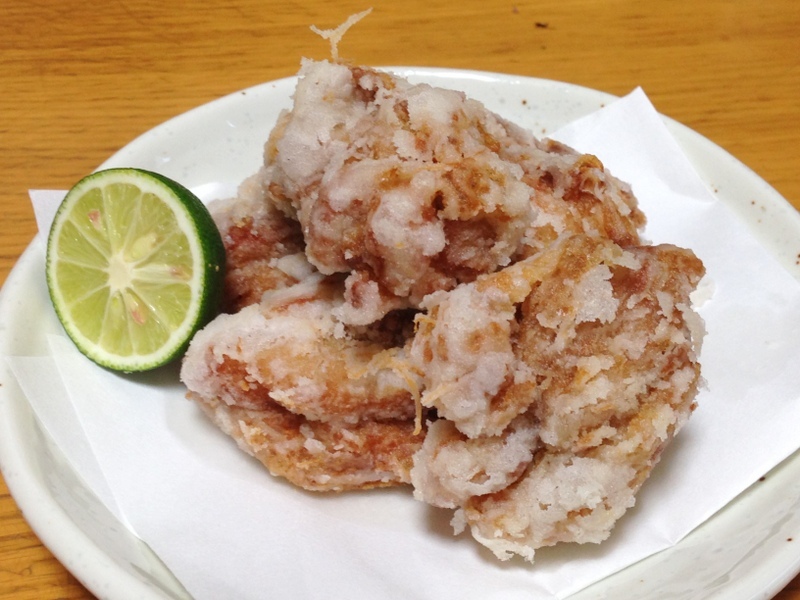 “Tatusta-age” is the another method of Japanese Fried Chicken. I had eaten Kara-age more than Tatsuta-age when I was kid. From such my experience, I guess Kara-age is may be more popular. But I like both because Tatsuta-age is also good one. 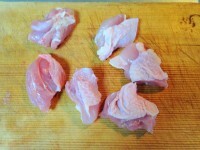 1) Cut the Chicken as a bite size. 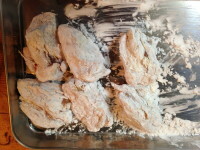 And place them in the sauce mixed Soy Sauce and Grater Ginger for about 10 min. 2) Squeeze the sauce by hand well. Then sprinkle Potato Starch well. 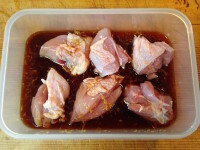 3) Fry the chicken in oil which is about 160 degree (c). Don’t touch it for about 2 – 3 min. Then flip it over. When the oil makes loud sound and small bubbles, it is the time to pick up. 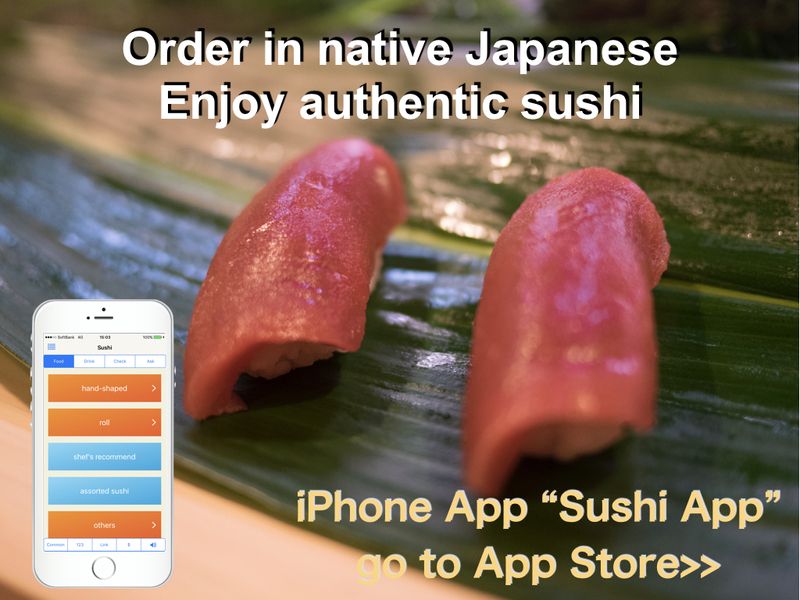 The top photo is serving with Sudachi, a Japanese citrus. If you can’t get it, lemon or lime will be good. Pour juice of citrus when you eat. To use a lot of potato starch for coating is an important point. Why is it called as Tatsuta-Age? There is two famous stories. 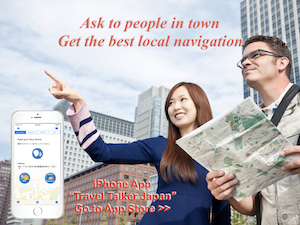 One is that it is named after Tatsuta River in Nara prefecture. It is the place where has very good sight and nature. In autumn, red maple leaves fall down from tree and run through the river. You can find contrast of red and white from the food on top photo. This contrast looks like one which people can see at Tatsuta River. Another one is that it is named after old warship “Tatsuta”. The chef of the ship tried to make Kara-Age, but they didn’t have flour in the ship. Then he used potato starch instead of flour. It was well accepted. Then this method is introduced nation wide. I’m not sure which story is correct. Personally, I prefer first one because I feel it is saying about the essence of Japanese traditional culture, “harmonizing with nature” . I just found this blog, it’s so informative, thank you! !